Needs a little love and devotion to fully unravel its many beautiful features. Released back in 2008, 'Narrow-Caster' was the third album from US based Progressive's 3rDegree and seeing as this little gem of an album has evaded the pages of Fireworks during the last three years, the upcoming release of the band's fourth album early next year is as good an excuse as any to highlight a band capable of blending angular Prog with Pop sensibilities and intelligently thought provoking lyrics. Not an album to make an instant impact 'Narrow-Caster' needs a little love and devotion to fully unravel its many beautiful features, with the majority of the songs being intentionally meandering and intricate. However, even though the tight time changes and almost Avant-garde tangents can dominate for periods, the element which continually shines through is melody. In fact there are even hints of Power-Pop to be found hidden in this complex and atmospheric music. Vocally 3rDegree also throw in a few curveballs, with the surprisingly bluesy roar of George Dobbs and the harmony vocals which feature throughout the album sitting unusually high in the mix for this style of music. During these sections wonderfully arranged passages of clean guitars sit alongside slightly more straight ahead beats and rhythms, making for a surprising clash of Blues, Funk, Avant-garde, Prog and Pop. 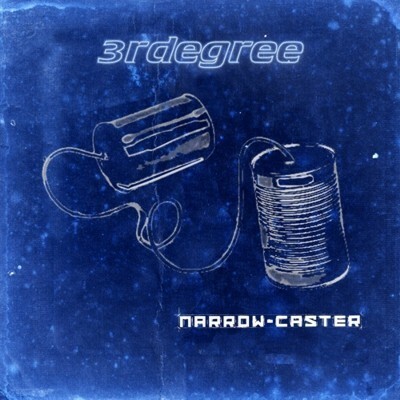 Instead of the confused rudderless noise that description may suggest, 'Narrow-Caster' is an album with clear focus, with songs such as 'Cautionary Tale' and 'Young One' being deceptively accessible. Dig deeper and the complexity is still there, but not having the need to shove their skill down your throat is one of 3rDegree's most endearing features. If however you are looking for something slightly more off-the-wall then the angular, yet catchy 'The Proverbial Banana Peel' should be perfect. Recent years have blessed us Prog lovers with a plethora of acts and albums to wallow in and 3rDegree undoubtedly deserve their place on that ever extending list.